There are very very few decent dedicated Twin baby carriers on the market, and seeing one in the flesh isn’t easy. So when the opportunity to host the Travelling TwinGo carrier came up I jumped at it – both as a chance to try this carrier out for myself and to enable some local twin parents to try one out for themselves. The TwinGo was designed by a twin mum who found wearing her babes helped her no end but did struggle with the bulkiness of two independent carriers on her petite frame (read her story here). What I love about the TwinGo is its flexibility – it can be used as two completely independent carriers or can be snapped together to form one tandem carrier without all the bulk of putting two independent carriers on one on top of each other. So how does this work? Well it comes as two carriers – the ‘base carrier’ (blue) and the ‘attachment carrier’ (orange). The base carrier looks just like most buckle style carriers available on the market – albeit with one of the biggest pockets I’ve ever seen! The attachment carrier looks similar but all its bits seems to come off! Straps detach etc… and it also has a huge pocket. In fact both carriers can fold into their respective pockets meaning that this carrier packs away to a surprisingly small size. To wear as a tandem carrier, the waistbands of the base and attachment carriers snap together, you then put your 1st babe on your back in the base carrier using your preferred method for this, then put your 2nd baby on your front in the attachment carrier and snap the attachment carrier onto the shoulder straps of the base carrier. There is then a safety belt that goes round the baby in the attachment carrier, in place of where shoulder straps would usually meet the main body of the carrier. 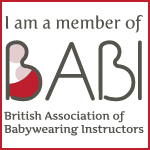 To wear as independent carriers, on two adults, one uses the base carrier as you would any other buckle carrier while the other first snaps the shoulder straps onto the attachment carrier and then puts baby on as you would any other buckle carrier. Simple!! Both can be used on either the front or the back in this configuration. The attachment carrier also offers a hip position too. This probably sounds more complicated to explain than to actually do, so I headed down to the local Twin group and my local children’s centre who kindly advertised it to all the twin parents on their books and we tried it for real! Sadly there’s no photos as I can’t take pictures at the children’s centre but with one demo the mums there felt really confident putting it on and most importantly comfortable! In fact I have to say I was very surprised by how comfortable I was too. I am currently 8 months pregnant and as I am always being told my demo dolls aren’t exactly light, but I really felt comfortable wearing two even over the huge bump (which is an achievement as I feel pretty uncomfortable all the time at the moment!). The carrier has a nice amount of padding and they’ve clearly really thought about how it all snaps together to ensure there isn’t unevenness that could lead to discomfort. In terms of specs, the TwinGo can take babies on the front from 4.5kg (10lb) unless combined with an infant insert… and while could be used for a newborn it is more of a ‘next step’ carrier like most other buckle carriers. On the back it can be used from 4 months onward as long as your little one has strong and consistent neck control. However, from 4.5kg it goes all the way up to a max weight 20kg (45lb) when used as two separate carriers and 30kg (70lb) when used as a tandem carrier. That translates to easily being able to accommodate two toddlers! Provided you yourself feel strong enough to do this of course. I think this carrier can be a great option for anyone who doesn’t currently own a carrier or owns something that their little ones are now growing out of (such as a tandem wearing little ones in ring slings or stretchy wraps such as the Moby wrap). In this case, the cost of the TwinGo (~£185) can be cheaper than buying two similar such carriers aimed at singletons … i.e. two Ergos, or Lillebabies etc – which are over £100 each. But there are other options! And some a great deal cheaper! Many carrier types aimed at singletons can be combined easily and less bulkily – woven wraps, mei tai and buckle carriers (particularly buckle carriers with very minimal padding such as the Connecta or Izmi Baby) – either with two of the same or more interestingly with a carrier of another type. By choosing two carriers of a different type it maybe easier to accommodate two parents of different body shapes and sizes but still having the option to comfortably tandem carry. So if you already own a carrier or sling, theres a good chance it can be combined with something else… meaning you might only need to buy one additional carrier rather than a TwinGo. For example I had a couple recently who were entertaining purchasing a TwinGo, but already owned 2 JMPBB stretch-hybrid wraps and a woven wrap. They wanted to gain confidence back carrying and add something that would be easier to back carry with. For them the answer was the Connecta, both were happy using it on their backs and happy using it over their JMPBB on their front. The minimal padding meant this wasn’t at all overwhelming even on the petite-framed mum. They also learnt to use their woven and JMPBB on their back so between the three carriers have a huge range of flexibility for different situations going out together or alone without needed to spend the money on a dedicated Twin carrier. The best bet for anyone thinking about what carrier to buy is to go and see your local sling consultant or visit a sling library and see some of these options for yourself and try them on! See how they’d work for you!